Welcome! We appreciate your interest in The Friends of the Menlo Park Library. For over sixty years we have been supporting the Library of Menlo Park, California, and the community it serves. 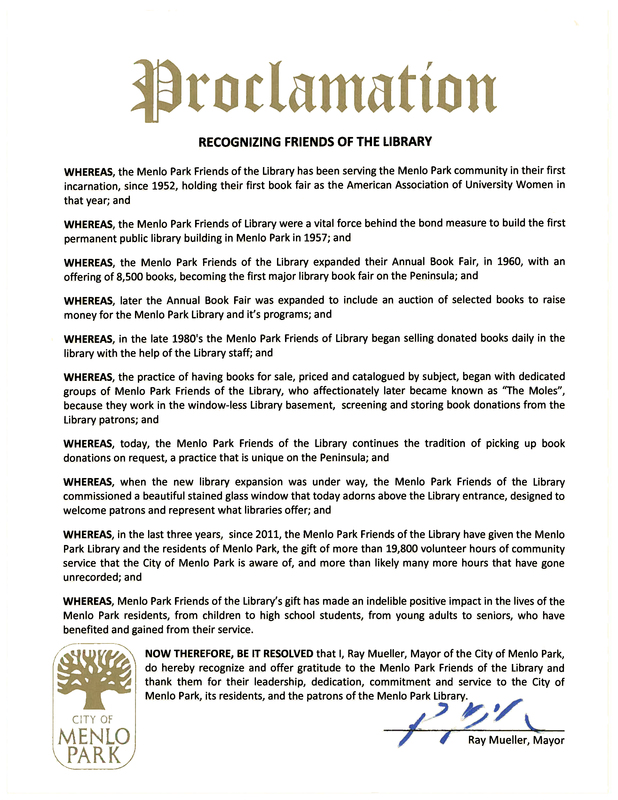 A Proclamation from the City of Menlo Park has recognized our indelible positive impact for Menlo Park residents. We thank our volunteers, members and donors, the Library staff and the City for their help in making our work possible. We invite you to find out more about us on this site. Our next regular on-site book sale is the Summer Sale being held on Saturday, June 1 (10 a.m. to 2 p.m.) and Sunday, June 2 (noon to 2 p.m.) Click here to download flyer. For information about the dates and times of all our 2019 book sales, please click here. For information about upcoming community events sponsored by us, please click here. Our Bookstore is open to the public whenever the Library is open. Please see Hours of Operation for the Main Library’s operating hours and holiday closures. Our Amazon online listings are accessible year-round. Free books are available in the Main Library courtyard each Wednesday (weather permitting) from around 9:30 a.m. until mid-afternoon.